This entry was posted on Wednesday, January 26th, 2011 at 10:01 pm and is filed under Uncategorized. You can follow any responses to this entry through the RSS 2.0 feed. You can leave a response, or trackback from your own site. Good day – I am Jean Nichols. I am trying to access the PDF modules on Principles of E-Government, but although I have downloaded ADOBE, I am unable to upload the modules. Can this situation be rectified. In order to access the pdf content of the course, you have to open a module and click on ‘Readings’. There you will find a link that will take you to the pdf version of the course. If you want a short path, you can click here to access the Principles of E-Government reading material. It should work fine. If you need further assistance, please contact us again. Michelle – thanks for your response. There still seems to be a block since when I launch the course, I am only able to open Modules 1-6 which is 47 pages. For Modules 7 and 8, I cannot open. I also clicked on the button in your response but it only gives Modules 1-6. I have also other persons to try to download Modules 7 and 8 for me but they too are having problems. 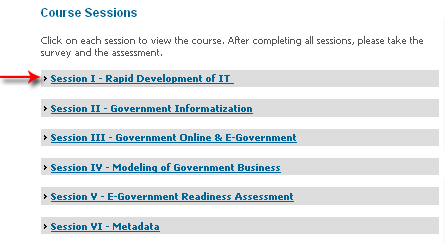 I am therefore requesting your humble intervention for Modules 7 and 8 of Principles of E-Government. Thanks. Michelle – I am still unable to open Modules 7 and 8 of Principles of E-Gov. Can you send a separate link for these 2 modules for me please. I did some testings and it is working, but I am going to keep trying to see if I get the same error to understand what is happening. Meanwhile, you can try to access the modules through their links: you can click here to access module 7 and here to access module 8. Please let me know if you need further assistance. Am trying to launch session one of decentralised governance and am unable anyone help me please and how long is the course? Thank you for using the UNPAN Online Training Centre. We tested the course and it is working fine from our end. Which browser are you using? We tested with both Internet Explorer and Mozilla Firefox, and it works fine. Please try using one of these browsers. If you still have problems accessing it, please send us an email to unpan@un.org. Hi Michel, am unable to log onto the assessment page. do i insert my username then the password i received after the survey? am a bit confused please help. In order to view the quiz you need to insert your name, password and email. If you need further assistance, please email me at alvesdelima@un.org. Kindly include in the email the course that you are taking. Hi there to every body, it’s my first visit of this blog; this blog carries remarkable and genuinely excellent data designed for visitors. way? I have a challenge that I’m simply now running on, and I’ve been on the look out for such information. Asking questions are in fact pleasant thing if you are not understanding something fully, however this post gives pleasant understanding even. With every thing that appears to be building throughout this specific area, all your viewpoints are fairly radical. are yourself not even totally confident of the assertion.